Stadium Super Trucks driver Matt Mingay underwent surgery to insert a prosthetic chin earlier this week, per the latest report from the driver’s Facebook page. 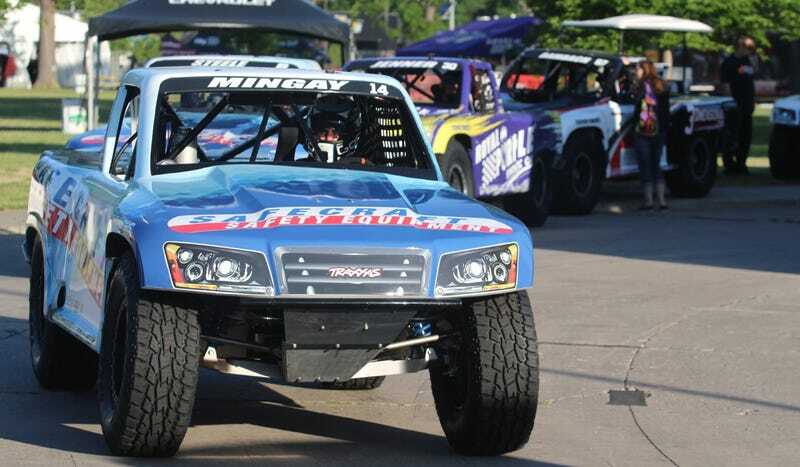 A crash at Detroit’s Belle Isle street circuit peeled open the top of his truck, leaving Mingay with severe facial injuries. Matt Mingay was yesterday released from critical care and remains in icu at Detroit Receiving Hospital where he remains in a serious but stable condition. Matt was released from surgery last night at 7:30pm after undergoing an extensive 5 hour surgery to insert a prosthetic chin to rebuild his jaw and mouth region. He has been responding well to treatment and will no doubt be counting down the days till his back out on track and wowing fans again. He has some of America’s finest surgeons working around the clock giving him the best possible care, although they can’t get over how many tattoos this crazy Australian Stunt Man has. Mingay remains in the Intensive Care Unit at Detroit Receiving Hospital, per the latest report from NBC Sports.